A nice little two gapper romp started the week off. Except for the transports, all major indices are now above the 50 day BUT! We throw in the capitalized BUT because even though we had the move up, not a lot has changed. What was good is gooder…but was bad, stays bad. To start, we would continue to avoid energy, oil&gas, most commodities, gold/silver, big retail, big telecom, airlines, everything auto including parts, parts retail, manufacturers and dealers. This does not include Tesla (TSLA) as it seems you have to lose a lot of money to act well in the group. We would also continue to not add to new commitments in most financials as they continue to lag after topping out weeks ago. So you can see, this is no way an A-Z market right now and as we go through earning’s season, there continues to be many blow-ups. But the good news is there continues to be a good amount of great reactions. Just take a gander at these names off their numbers. AAN, ALGN, BJRI, CERN, CAT, GLW, GOOGL, HLS, ISRG, IDXX, MCD, PKG, RCL, SHW, TMO, TSS…and this is just a short list. All the talk has been the strength in Nasdaq/NDX. The relative strength continues as a few mega-cap names continue to lead. We did want to make note that the advance/decline figures are lagging the indices badly indicating it is becoming very narrow. We are fine with this. Upcoming big name earnings are Facebook, Apple and Priceline. Google had a nicve breakaway gap Friday but Amazon’s gap was distributed. There has still been no corrections of consequence since the election. Many are worried about valuations. They are not wrong but as technicians, we’ll let the market decide. Until the indices lose support/moving averages, it is folly to get overall bearish. When that occurs, you will know it. 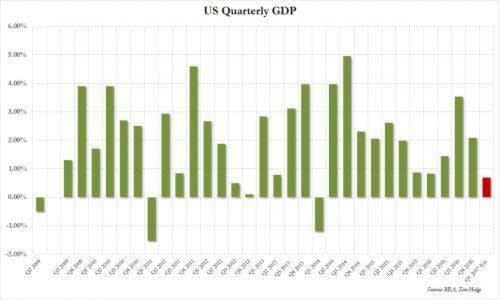 CHART OF THE DAY-GDP GOING THE WRONG WAY! http://garykaltbaum.com/wp-content/uploads/2017/04/gdpppppp.jpg 300 500 Gary Kaltbaum http://garykaltbaum.com/wp-content/uploads/2019/01/gary-k-logo7-01.png Gary Kaltbaum2017-04-28 12:10:422017-04-28 12:10:42CHART OF THE DAY-GDP GOING THE WRONG WAY! After 8 years of 0% interest rates…after printing of over $5 trillion over here…after negative interest rates around the globe…after printing another $15-20 trillion around the globe (depending on which abacus you are using)…after actually using printed money to buy up their own markets…after gargantuan, monstrous, monolithic, over-the-top, cannot even be counted deficit spending…we just came in with a whopping GDP growth of 0.7%. That’s 0.7%. As far as markets, big cap tech/internet continue to lead. Lots of strong earnings reactions to the upside. This is good news. We will get more in-depth in the weekend report. Special live Neil Cavuto on Fox News Channell at 10 am et Saturday covering Trump’s first 100 days. Don’t miss it. Lots of jello moving on the plate! Futures up a wee bit. To the downside: MLNX, FFIV, AMGN, ORLY, BWLD, CMPR, FTI, LUV. AAL, NTGR, CTB, EFX, ETH. In Trumpland, as usual, tax cuts being met by the media and the left as the end of the world. They want you to forget IT’S YOUR MONEY! Don’t believe the lie that deficits have been caused by tax cuts. Deficits have been caused by assinine, assiten, asseleven government spending that refuses to go down and always goes higher. Go google a chart of federal spending going back to just 2000 and you will see what we mean. Wouldn’t get twisted that the market sold off late in the day it is just overbought and needs rest. The financials (which are not leaders) seem tired into resistance .Whether or not market rests is another story. The big story is the great reactions to earnings in many names like TMO, ANTM, IRBT and WYNN. It is these names and reactions we concentrate on going forward as they look to set up off their moves. There is a ton more earnings coming out. Tomorrow, GOOGL, AMZN, INTC, MSFT, SWKS, SBUX, GILD, EXPE and that’s for starters. We would not mind at all if market rests a bit. In fact, it would be the best thing for it. BASEBALL SLIDE OF THE YEAR! http://garykaltbaum.com/wp-content/uploads/2015/11/Real-time-strategies-for-your-portfolio-pic.jpg 680 1110 Gary Kaltbaum http://garykaltbaum.com/wp-content/uploads/2019/01/gary-k-logo7-01.png Gary Kaltbaum2017-04-26 15:05:252017-04-26 15:05:25BASEBALL SLIDE OF THE YEAR! —–Don’t you love how the left and the media are now all of a sudden worried about whether the tax cuts will cause more debt going forward? They did not give a crap as Obama won the championship belt on debt with $9 trillion during his tenure. Didn’t remember them asking whether the $800 billion stimulus would be paid for.. Just remember, to the left and the media, debt only matters when the other side is running things. —–Where is all the talk about the size of government? Where is all the talk about federal spending? Where is all the talk about an out of control government in which spending always goes higher, unchecked and unaccountable? Where is all the talk about an economy that $4.1 trillion will be sucked out of this year? Unfortunately, all the talk is on tax cuts and how they are going to be paid for. Paid for? It’s our money. Government can only open up its doors because of us. Every dime spent by government is because of our largesse. Yet they continue to disrespect us by telling us we have too much and they have too little. —–Why do we have to pay for any tax cuts? Why can’t they just lower their spending? The conversation should not be on our taxes…which should be lowered. The conversation should be solely on how much and what the government is doing with our money. There is just no accountability on spending. The problem is the left and the media automatically state that higher taxes are always necessary. But let’s go through some facts. We sent the federal government last year approximately $3.3 trillion. Let me repeat that number: $3.3 trillion and they couldn’t even balance the budget with that amount of money. On top of that, they say they need more…and they need more for infrastructure. You remember the infrastructure that was supposed to be paid for by Obama’s $800 billion, shovel ready stimulus? We know what was shoveled. This year federal spending is now up to $4.1 trillion from $3.7 trillion last year. Who gave government the raise? Who gave them the green light to spend another $400 billion of our money. The government did. The same government that has put us into $20 trillion of debt. Yet they continue to run the show. Where does it end? Where does it stop? The last year of Bill Clinton’s budget, federal spending was less than $1.8 trillion. It is now $4.1 trillion. Where the hell is all the money going? Yet they tell us tax cuts have to be paid for because they need more of our money. —–We will repeat…we need to change the trajectory on not only how much we send them but on how much they spend. What law states Federal spending must go up every year? Eventually, these debt, deficit and asset bubbles are going to blow up and all that will happen is that each side will blame each other. They are both to blame, just one is worse than the other. Throw in the media saying nothing about Obama and his championship belt with debt, $9 trillion in 8 years, and you get to where we are. —–It is simple. Government is too big. Government grows too fast. Government has no accountability. Government has no checks and balances. And every dime of government is paid for by us. They cannot even turn on the lights without us. This has got to stop. We were and are in hopes Trump was going to do something about this but not hearing much. We hear Mnuchin matter-of-factly state the debt ceiling will be raised. Thrilling! How did we get to the point where there is no fight about raising the debt ceiling? TO BE CONTINUED!